The summer flew by, and now it’s back to school for kids and the return of a more normal schedule. This is also a popular time of the year for families to resume their bi-annual dental checkups. To start the school year off on the right foot, and in a healthy manner, here are four surefire tips to make sure your upcoming dental checkup with kids goes smoothly. With a busy summer schedule full of fun, it’s easy to let the details of a new school year slip your mind until it creeps up on you. And there is no shame in that, we have all been guilty. But putting off scheduling your kids’ dental checkup can make it more difficult to schedule your appointment. We see a lot of patients around the back-to-school rush, and typically see a schedule backup, as any healthcare office does this time of the year. So keep that in mind when scheduling. Speaking of scheduling, also make sure you pick a time that’s right for your child. Steer clear of scheduling a time of day when your child is typically cranky or irritable to avoid a meltdown in the office. We want your kids to enjoy their visits with us. It helps encourage them to see dental care as a good thing. Encouraging good dental habits at home all year-round is the best way to ensure easy office visits. A cavity free visit is the best type of visit. Parents can help make this a reality by encouraging your kids to brush twice daily for two minutes, as well as flossing once a day. Ages 6 & Under: Let them take the reigns, but be there to jump in when needed. Kids on the upper end of this range may have molars coming in that they don’t know how to care for just yet. Ages 7-12: Kids these ages know what they’re doing when it comes to dental care, but they don’t always want to do it. At this stage it’s important to nudge your kids to stay consistent with their habits. Ages 12-18: Kids these ages may not have grown up with a lot of cavities, which is great, but at this point it could cause some issues. Teens get set in their ways, and may not be doing a more thorough job even though they may have more freedom in their diets at these ages (consuming sugary drinks and candy at school when mom and dad aren’t around). This can lead to cavities and set them up for dental issues now and in their early adulthood. 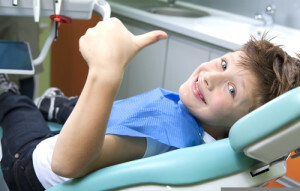 Even if you are a bit nervous when headed into the dentist office, try to keep that anxiety in check around your kids. Kids are led by their parents’ example, and if you walk into the office cool and collected, they will take note and follow suit. It’s a small thing that can go a long way in keeping your bi-annual visits with us smoother. Call your San Antonio neighborhood dentist, Dr. Skrobanek at GPS Dental today to schedule your child’s next checkup. You can reach us at (210)-633-3477.